When we travel to Oregon State University in Corvallis, we like to stay across the street at the Hilton Garden Inn. For dinner one night, we had a very tasty vegetable side dish with squash and arugula. I found a similar recipe online at Simply Recipes but added a few items to make it more like what I had in Corvallis. Go to the Simply Recipes site for excellent directions with pictures on how to brown butter. Heat a large skillet on medium then add two tablespoons of butter. Whisk frequently as the milk solids in the butter turn to a light brown and get a nutty aroma. Do not burn! Remove from heat and add julienne strips of onion. Return to medium heat and cook until lightly caramelized. Remove the onions from the skillet leaving any residual butter to slowly cook the sliced garlic. From here you can continue the cooking process or hold the onions and garlic until later like I did to make the final assembly for dinner easier. 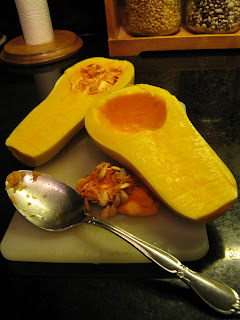 Remove the seeds, peel and dice the butternut squash into 1/2 inch pieces. Put the three remaining tablespoons of butter in a clean skillet to brown. Remove from heat and add thyme. Return to medium heat and add the diced squash. Toss to coat with butter and thyme then spread out in a single layer. Cook without stirring until browned on one side. Stir and spread out again to brown on another side. Return onions and garlic to the pan, cover and cook on low for 10 to 20 minutes or until the squash is tender. Just before serving, add arugula and hazelnuts and season to taste with Worcester sauce, salt and pepper. Cook just long enough to wilt the arugula.